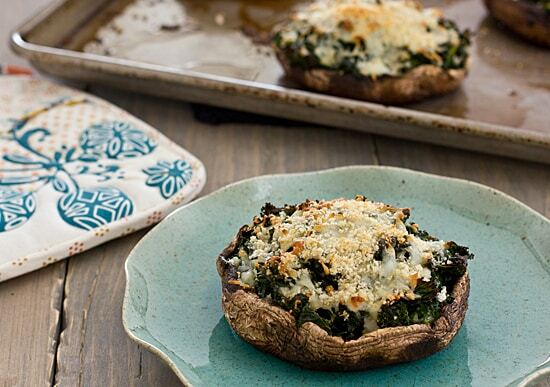 Kale-Stuffed Portobello Mushrooms Recipe - Oh My Veggies! You know how sometimes you meet someone and if feels as if you’ve known that person for years? During my first weekend of blogging, I struck up a conversation about vegetarian cooking with Valerie from Eclecticisms and we’ve been emailing back and forth since then. We decided to do a veggie cooking challenge–this month’s theme was casseroles. Mmm, casseroles. Growing up in the Midwest, casseroles are an inescapable part of life. And just so you know, no casserole is complete without a can of soup and copious amounts of cheese. So anyway! I chose a casserole recipe for Val to remake and she chose a recipe for me to makeover–Chicken Florentine Casserole. As you can see from the original recipe, it’s pretty fattening. Oh, and then there’s the chicken and the canned soup and cheese that’s de rigueur for most casseroles. Making this recipe vegetarian and lighter really was a challenge. Because I’m not much of a spinach fan, I decided to use kale instead. We can all agree that kale is way better than spinach, right? It’s not slimy! And it’s delicious! Clearly chicken wasn’t going to work in this recipe either, so I used portobello mushrooms instead. Then, in place of the cream of mushroom soup, I added milk and flour–that way, the end result is lighter and it has far less sodium. In the end, I guess these Kale-Stuffed Portobello Mushrooms really don’t resemble the original Chicken Florentine Casserole in any way, shape, or form. But that’s okay, because they’re tasty, healthy, and filling too. These Kale-Stuffed Portabella Mushrooms are a lighter, healthier remake of Chicken Florentine. Spray tops of mushrooms with olive oil. Place bottom side up on a large rimmed baking sheet and season with salt and pepper. Heat 1 tablespoon of olive oil in a large skillet over medium heat. Add shallot and garlic; sauté until softened, 2-3 minutes. Add kale and wine, increase heat to high. Once wine has cooked off (about 3 minutes), add milk and flour. Return heat to medium and cook until sauce has thickened, 3-4 minutes more. Remove from heat. Divide kale mixture into mushrooms. Top each with 1/4 cup of cheese. Bake for 10 minutes. Combine panko and 1 teaspoon of olive oil in a small bowl while mushrooms are baking. Top each mushroom with 1 tablespoon of panko mixture and return to oven for another 5-8 minutes, or until mushrooms are tender and panko is golden brown. "And just so you know, no casserole is complete without a can of soup and copious amounts of cheese." This looks absolutely delicious, and I LOVE the substitutions and tweaks you made! Whenever I make green bean casserole I ALWAYS add mushrooms, but sautee them first. It gives such an amazing flavor. Can't wait for our next challenge! What a great idea! I never thought to stuff mushrooms with kale! Usually recipes use some sort of cheese/breadcrumb/mushroom stuffing, but this sounds so delicious, more diverse, and healthier! I’m a wee bit obsessed with kale, so I am constantly looking for different things to do with it. 🙂 I will use it with anything! Looks yummy! The recipe calls for white wine, is that like, actual white wine? Or the white wine rice vinegar? I’m adding these to my menu plan for this week! Going to give ’em a try! Just curious how this might leftover! I’d be making this just for myself and wonder if it’d still taste as well the next day or two. I made these tonight, and they were a huge hit! My husband, who has an aversion to anything healthy, loved them. Even my two year old gobbled it up. I’m happy to hear you enjoyed the recipe! I was wondering if the recipe can be made a day ahead and cooked before serving? Thanks! I’ve never tried it, but I think it would be fine, although it would probably be best served right away. We want to make these vegan, but are newbie vegans and haven’t learned all the tricks yet. Would any non-dairy milk substitute well in this recipe? I imagine Daiya shreds would work as well for the cheese … thoughts? I haven’t made this vegan so I can’t say for sure, but I think that would work.